Today I had Tosei Rawa for brunch. It’s been a while since I last had it. Drama Queen ordered a Maggie Mee Goreng, much to my objection. But that contriving Drama Queen said “but it’s just once in a while, not like I eat it every day or every week” that I succumbed to her request. See how manipulative this girl is! Well, this will be the last time she gets to eat Maggie Mee Goreng. Read on to find out why. Worker #1 was trying to repel and kill some cockroaches at the food display section where he whipped out a can of Ridsect. He then sprayed toxic fumes liberally at the food display area and there was no cover / lid on the cooked curries, fried chicken and Briyani rice!! When I thought he was done spraying the floor, he opened up all the doors of the cupboard under the food display unit / warmer and sprayed more chemicals inside. While worker #1 was busy spraying toxic fumes at the cockroaches with oblivious and unsuspecting patrons eating nearby (expect for me, the ever curious kpc), worker #2, with a bottle of pink color chemical started spraying and wiping all the tables and chairs with the cleaning agent and cloth. With the same cloth that’s not washed, he went to the chiller / fridge where canned drinks and peeled hard boiled eggs are kept to clean the fridge with the pink color liquid cleaner and contaminated cloth. Just when I thought that he was done wiping the exterior of the fridge door, he opened the fridge and sprayed more chemicals on the interior fridge door, with the peeled hard boiled eggs just inches away from the chemicals – and wiped it with the same piece of unwashed cloth that he’s used to wipe the dirty tables and chairs! Oh. My. Gawd!! That’s it. This will be my last time patronizing this eatery. This is the problem faced by eateries that are opened 7 days a week, 365 days a year. There is hardly a day for the owners to fumigate the eatery to repel it from pests. 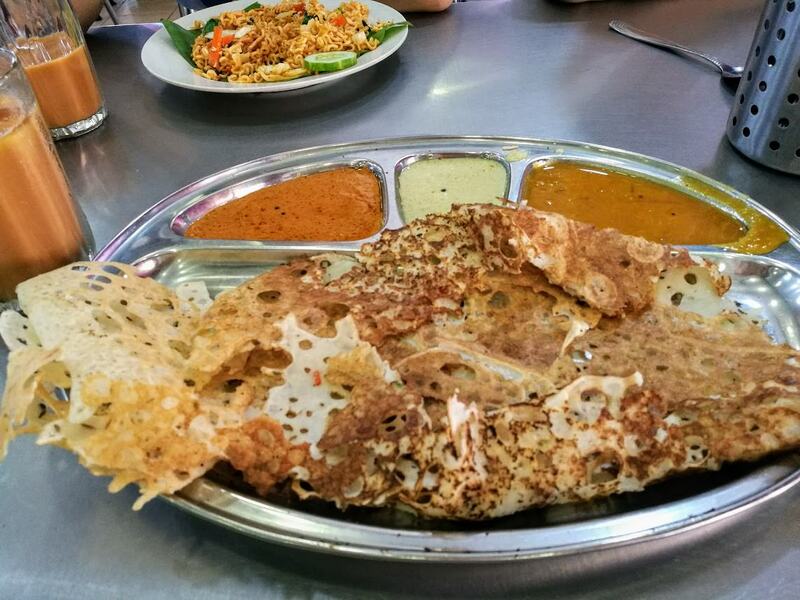 I am sure that what I saw today is happening in most eateries which are managed by foreign workers, with little or no training on proper food handling given. And the boss is hardly seen at the outlet to supervise. This is why cancer is so prevalent as more and more people are exposed to chemical carcinogens everyday, everywhere, even at home when most of us are exposed first thing in the morning ~ from our toothpaste to our personal care products. As a mother, it can be challenging to maintain a healthy workout routine. After all, the children have their needs and the pile of papers at work is growing by the moment. However, none of those things matter if you’re in disarray. You can’t be of service to anyone if you can’t take care of yourself. Make your workout routine a main priority as a self-affirming practice. It’s so important to understand that you matter. As you take the first few steps toward the gym, consider these tips to help you build a workout routine that you love. As a mom, you might get tempted to stay home and skip a workout when a child gets sick or things get crazy. Instead, work out from home. Log on to YouTube and check out all the free exercise videos. You can easily work up a serious sweat within 20 minutes. If a workout seems really boring, you’re less likely to complete it. If nothing about jogging intrigues you, find a dance class to enjoy. When you like the workout, you’ll be more likely to lean in and enjoy it. Take a look at some of the physical activities you tend to gravitate toward. If you love watching basketball, join a local league. If you love rollerblading, purchase Rollerblades and head outside. Keep it interesting and you’ll keep coming back. You shouldn’t be able to leave a workout and think that it was really easy. In order to achieve a physical fitness goal, you’ll have to challenge the body and get it out of its comfort zone. If you tend to shy away from a cardio cycling class, it’s time to get on a stationary bike and begin working out. The more you face your challenges, the sooner you’ll conquer them. Before you begin your new workout regimen, sit down and figure out your goals. If your only goal is weight loss, write it down. If you desire to work out so that you can maintain a beautiful body and optimal health, write those goals down. If you are working out so that you can learn how to swim faster, be clear about that. As you set the goals, make sure that you also write down the ways you ‘re going to turn those goals into realized achievements. In order to improve your technique, you’ve got to get into the pool. If you’d like to improve the look of your body, you’ll want to examine the areas you don’t like. Then, find workouts that target those areas in particular. Once you’ve become clear about your goals, it’s a lot easier to focus and get into the zone when you’re ready to workout. Many of us are thinking about trying to lose a little weight before Christmas. In most cases so that we can gain it back again with all of the holiday eating. But, then when January hits, you might want to start thinking about a more long-term plan. Losing weight, leading healthier lifestyle or toning up are typical new year’s resolutions. Even those that are usually happy with their figures can be tempted to try and lose a little weight following some heavy festive overindulgence. Most people fail. We spend our years drifting from one diet to another, losing a few pounds only to put it straight back on again, never quite happy with the results or how we look. That’s because most of us are making at least some, if not all, of these 11 mistakes. The main reason we fail when it comes to losing weight is not setting realistic targets. We announce that we want to lose a huge amount of weight for a specific date, which is either too close to be realistic, or that far away that we’ve got no real motivation. If you are a relatively fit and healthy person, you should aim to lose around 1lb per week. That’s about 3500 calories. So, to lose that one pound, you need to eat 3500 calories less than you use up. Which means cutting 500 calories a day, or burning off 500 extra with exercise. Setting a weekly goal, while working towards a larger goal gives you a realistic, measurable target. While one pound a month doesn’t sound like much, it’s something that you can achieve, and quickly starts to become a noticeable amount. A huge mistake people make is weighing in every day, sometimes twice a day. If you are only going to lose 1lb per week, daily you might not notice a change. So, you’ll be disappointed and much more likely to give up or overindulge. Instead, weigh in once a week to measure your success. Cutting 500 calories a day can be a lot. And, even if you do manage it, it might not work for long. Or if it does, you’ll be left with a soft, flabby body. To lose weight consistently and look fantastic, you need to exercise. Home Improvement loans can give you the option to install a home gym if you don’t fancy exercising in public, but there are plenty of options, so you are sure to find an exercise regime that suits your tastes and lifestyle. Crash dieting is always a mistake. Making too many changes to your diet isn’t sustainable, and you’ll put all of the weight back on as soon as you stop. Instead make a few simple changes to your diet such as cutting sugar, switching to brown rice, pasta and bread and drinking more water. Cutting entire food groups is unlikely to help you lose weight and could affect your health. Dieting doesn’t have to mean that you can’t have the occasional treat. Allowing yourself to have a little of what you love will help you to stick to a diet and see great results. If you try to stop yourself completely, you are more likely to give in and have a huge binge. Dieting isn’t just about cutting calories. If you are aiming to eat 1500 calories a day, then it’s important to realise that not all calories are equal. 1500 calories of nutritious and healthy food, such as brown pasta, salads, cereal and grilled meat can fill you up easily. 1500 calories of junk food and treats won’t seem half as filling. People think that cutting breakfast is the easiest way to cut calories from their diet. But, failing to eat breakfast can see you eating more calories throughout the day. Instead, opt for a healthy and filling breakfast such as eggs or porridge to start your day right. When you diet, it’s important to track your calories. Sounds easy enough but when you are exercising and cooking your own meals, it can be hard to figure out. Overestimating the number of calories your exercise burns can allow you to think it’s safe to eat more than you should. A fitness tracker can help but as a guide, a 150lb person jogging at a 12-minute mile pace for one hour burns around 475 calories. Another common mistake people make is underestimating how much they eat. 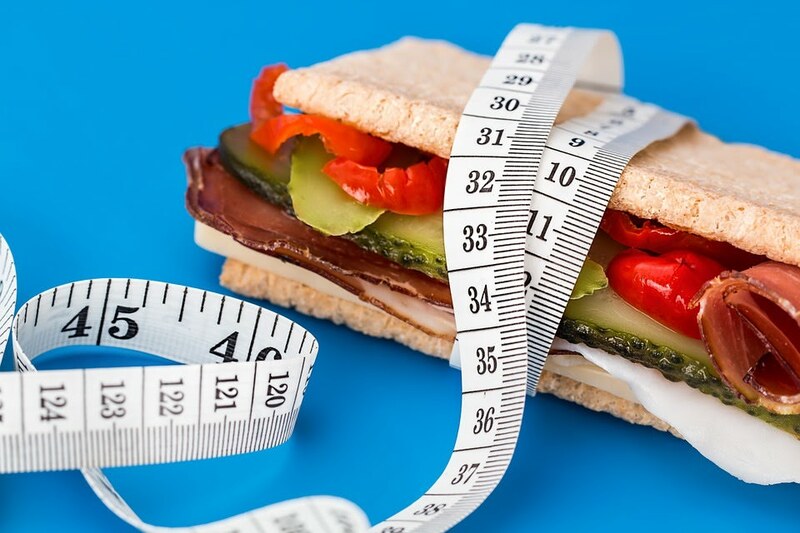 Portion control can be a massive problem for dieters. If a 50g Portion has 200 calories, you need to make sure you only have 50g to be able to record 200 calories. It can be useful to weigh your food or use a portion plate to help. Dieters often fail to track the calories from any drinks they consume. Fizzy drinks, alcohol and high-fat drinks such as milkshakes, contain as many calories as some meals. Try to avoid them and stick to water instead but if you do drink something else, track the calories accurately. Fat, in small quantities, can actually be very good for you. Low-fat foods often contain more sugar and other unhealthy ingredients. So, instead of switching to low-fat thinking you are making a healthy change, just try to eat smaller quantities of full-fat products. Losing weight and maintaining a healthy lifestyle doesn’t need to be difficult. With so much advice and so many different guidelines on what you should be doing or eating it can be easy to get confused and try to take everything to the extreme. But, for most of us, this won’t lead to lasting results. Instead, you need to make a few simple changes like eating less sugar, drinking more water and exercising more. Focus on eating a healthy and well-balanced diet and getting regular exercise, and you’ll soon find the lbs dropping off. On the approach to summer, you diet and exercise in an attempt to achieve the ever sought after, perfect beach body. Then, summer arrives. You look great. You feel confident, and it’s warm, so you keep it up. You go to the gym or out for runs in the sunshine. You eat salads and drink plenty of water. You’ve got loads of motivation, and you are reaping the rewards for all of your hard work. Then, it starts to get cold. It’s dark before you leave for work, and dark when you get home. Motivation has left the building. All you want to do is put your pyjamas on and pig out on some warming comfort food and treats. Besides, you’re going to be covered up for the next few months now, who cares if you get fat? Well, you should. 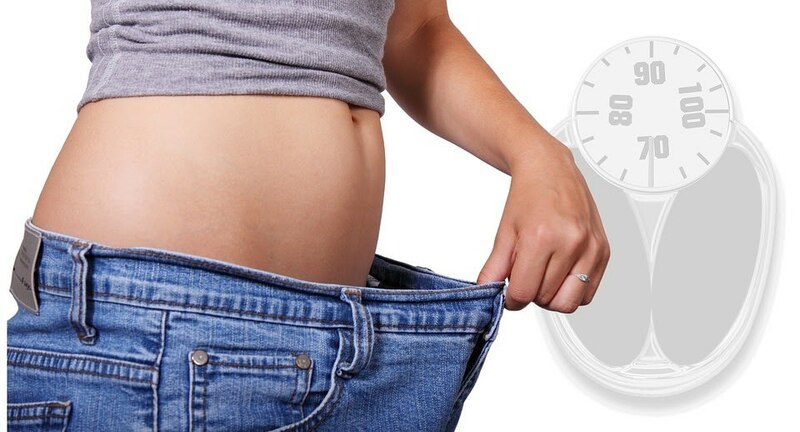 Gaining weight at any time of year can have a negative effect on your confidence, mood and quality of sleep. It can leave you at a higher risk of picking up winter bugs, and it can even lead to long-term health conditions. So, you need to find ways to keep motivated, whatever the weather. It can be demoralizing when you are dieting and exercising and not seeing any results. Sometimes you need a kick-start in the form of a diet plan with fast results. To get the best results, it’s important that you workout while dieting, check out the workout schedule for the 21 day fix from defendyourhealthcare.us to see how a plan like this could help you. But remember, once you’ve had your kick start, you need to keep it up to see sustained results. Exercising early in the day is an excellent idea in the colder months. That way it’s done, and you don’t have time to make excuses later. It also means you’ll start each day on a high, feeling happy and proud of what you’ve done but also getting a nice little adrenaline buzz. One of the main reasons people gain weight over autumn and winter is their diets. It’s tempting to eat huge hearty meals every night as no one wants a salad when it’s snowing outside. 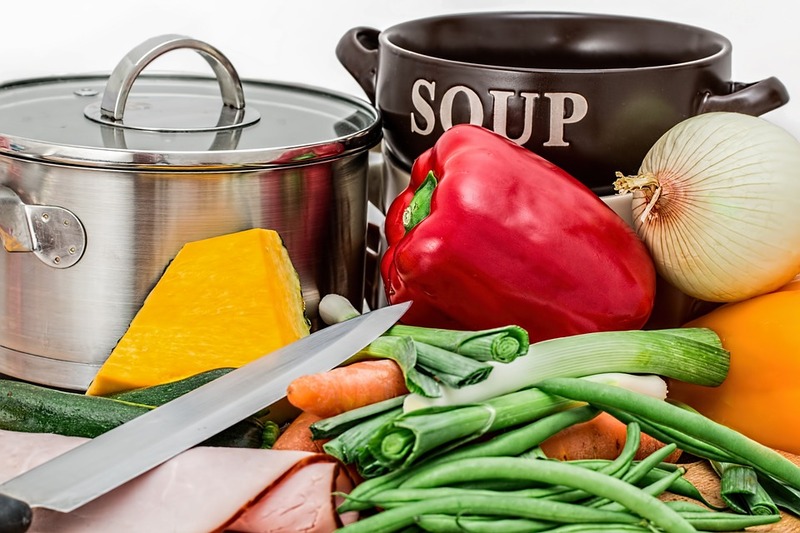 The key is finding ways to make your warming meals healthy. Cook from scratch, so that you know exactly what is going into all of your meals. Then, use low-fat ingredients and pack each meal with vegetables. Eating healthy never has to be boring, you just need to think about it. The best way to stay motivated when it comes to exercise is doing something that you love. If you hate running, you’ll hate it even more on a cold winter morning. So, don’t force yourself. Go to a dance class instead. If you like doing something you are much more likely to make time for it and stick with it instead of making excuses. It’s perfectly possible to have that perfect body all year around. You just need to stop making excuses and push yourself that little bit harder when it’s cold. I was flipping through The Sun papers today and saw this very interesting article. My habitual way of walking fast involuntarily is beneficial to my heart and can be life-saving! So it’s proven. 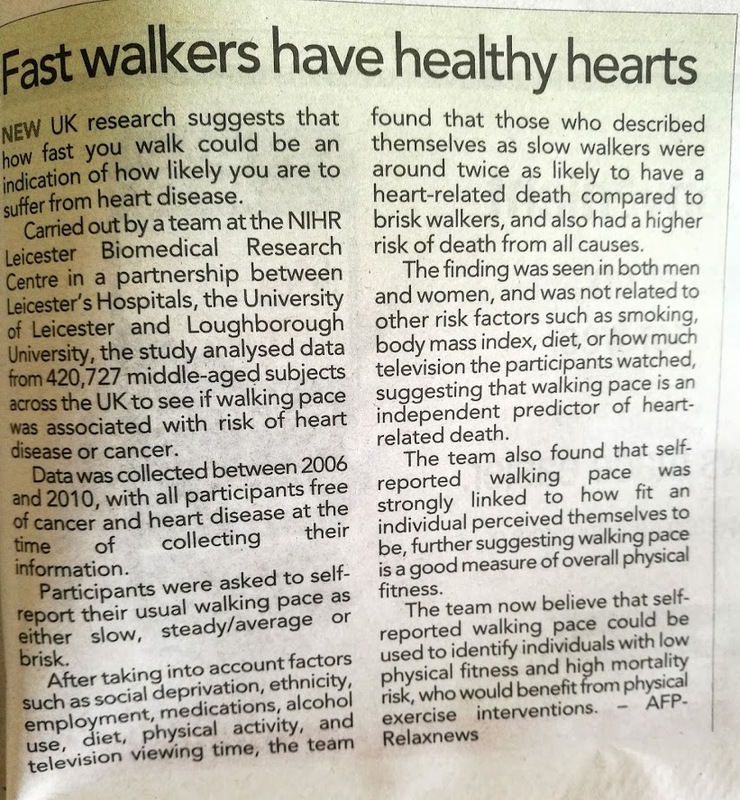 Research studies have confirmed that people who walk faster have healthier hearts than their slow-walking counterparts. I also observe that people who walk fast are also fast workers, very efficient and hardworking. This includes yours truly here, ahem.. not self-praising here but I think it’s very true. Wouldn’t you agree with me too? All food and no exercise spells trouble for your body and I kid you not. Exercise is good for your heart, mind, body and soul. You may not feel the difference now if you are still in your 20s or 30s. But once you have hit forty and lead a sedentary lifestyle, you’d most likely begin to notice the differences in your body. People who do regular activity have a lower risk of many chronic diseases, such as heart disease, type 2 diabetes, stroke, and some cancers. Research shows that physical activity can also boost self-esteem, mood, sleep quality and energy, as well as reducing your risk of stress,depression, dementia and Alzheimer’s disease. Given the overwhelming evidence, it seems obvious that we should all be physically active. It’s essential if you want to live a healthy and fulfilling life into old age. I want to be able to still run around and travel the world even when I am 84 years old or 90 years old. There’s this 84-year old grandmother at my condo who is fitter than I! She wakes up at 5am everyday and works out for several hours at the pool area, practising her sword and fan tai chi movements, brisk walking and does body stretching. She then sits at the gazebo by the pool and chats with her peers until 10ish am each day. She gives me so much inspiration whenever I chat up with her or simply just by looking at how spirited and sprightly she works out each day, with so much energy bursting in her. At the same pool area too each morning is a 78 year old grandma who moved in 2 months ago. She walks with the support of a walking stick and an Indon helper. She looks like she is into her 90s. When I chatted up with her, I found out that both her kidneys were removed. She can only eat plain vegetables and nothing else as she is not undergoing dialysis. She is currently consuming Chinese medication. So the conclusion is eat well, eat clean and exercise regularly and you could be like the 84-year old healthy grandma. Put crap into your body and you will suffer in your later years. No joke. Love your body for you only have one. If exercise were a pill, it would be one of the most cost-effective drugs ever invented! I was the only person swimming this morning, which makes the pool looks oddly gigantic and creepy. Have you ever tried swimming alone at 6:30 in the morning under the threatening dark skies with no one else in the pool except you? Add the strong howling winds and chilly water and you’ll feel like you are in one of the scenes from Nightmare On Elm Street. This morning, I felt and saw the currents of the pool water each time the strong wind blew and howled. I soldiered on and after 30 minutes, I managed to complete 28 laps continuously, complete with body stretches and aqua cycling. It poured just after I completed my 28 laps. It is hard to explain to you the awesome feelings one gets after exercising. If you haven’t started on an exercise regimen yet, why not try it today? Yes today! It can be as simple as climbing up and down the stairs in your house or walk up the stairs to your unit if you live in a condo. I used to jog outside the house at 5am with a baton in my hand and another round of running at 7pm when I returned from work. Rain or shine, I would exercise, even if it meant running whilst holding an umbrella. I was and still am that determined and no one can break my will power. Getting regular exercise aside, eating clean is just as important. Whether you are a carb-cutter, carb-loader, paleo warrior, or intermittent faster, your golden rule of clean eating should be to include as much fresh produce in your daily diet as possible. Here’s one of my home-cooked dinners last week – baked Halibut steak from Greenland. It was the first time hubs bought this fish and the meat was very smooth and creamy. I baked the fish in two different styles – two pieces were lightly seasoned with sea salt and black pepper and another piece coated with wholemeal bread crumbs. Verdict – the breaded one won. And my conclusion is to bread the fish each time I bake fish in future. Baked Portobello mushrooms with garlic. Stir-fried organic cabbage with shredded carrot, garlic, onions and eggs. No More Excuses! Get Fit Without Joining A Gym! Running is an excellent way to stay fit, which is why you see so many runners everywhere! The great thing about it is that you get to go outside. You can run, and feel the fresh air in your lungs as you do it. Plus, it;s something you can do at any time of day. Early morning before work, or late at night before bed. There’s really no excuse, apart from when the weather’s bad. And, even then, some waterproof running gear is all you need. My biggest tip is to buy proper running trainers. This is because you need the right support when you run. Otherwise, it can be damaging to your joints. One of the main reasons people think they need a gym membership is because of the equipment there. But, there’s an easy way to work around this and save a load of money. You can create a gym in your home with ease. Especially if you have a spare room or garage that isn’t used as much as it could be. These are the perfect places to set everything up. All you need is the best home gym equipment for fitness workouts. I’m willing to bet you won’t use every machine in the gym, so, you’re wasting money. Most people will only need five machines maximum to get a good workout in. Things like treadmills, bikes, etc. Get some weights as well, and you’ll be sorted for all types of exercise. It may cost a lot to start with, but, you’ll save so much over time. Plus, you have more motivation as your gym is right by you at all times. No excuses, just go to your home gym and get fit. Believe it or not, but playing with your kids can get you fit. I know, it sounds funny, but it’s true. Anyone with kids will back me up here and tell you all about it. Head outside to a park and play with your children. You’ll find it difficult to keep up with their endless energy. They’ll get you running around and joining in with their crazy games. Before you know it, you’ve worked up a heavy sweat! The great thing about kids is that they love playing sports too. No doubt your children will always ask you to go into the garden and play with them. Kick a soccer ball around with your kids a few times a week, and you can get fit. Of course, you should combine these ideas with a healthy diet. There are plenty of fitness-friendly food ideas for you to enjoy. Regular exercise, combined with a balanced diet will get you fit in no time! If you want a basic bodyweight exercise, then the push up is for you. It’s not hard to do one, and there are variations to make them easier or harder to do. This exercise will target your chest and triceps, depending on how you do it. The closer you have your hands together on the floor, the more triceps activation you get. A typical push up will be done with hands at shoulder width, so you get a great bit of chest activation going on. You can also do clapping push-ups to make the exercise even harder, and grow bigger muscles. Plus, you need no equipment for this movement, all you require is enough space to lie down! The pull up is the greatest test of upper body strength there is. By doing this exercise, you’ll be working a whole host of muscles against the weight of your body. Primarily, pull ups will target the lat muscles in your back. Also, you get considerable activation in your trapezius muscles, most notably the lower traps. As a bonus, pull-ups will also work your forearms and biceps; it’s an all round muscle building masterpiece. Most people think you can only do pull-ups in the gym, but this isn’t the case. You can do them on a door frame or the back of some stairs in your home. There are also companies like PullUpMate that do portable pull up stations for indoor use. 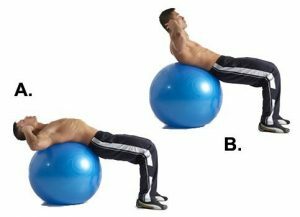 I strongly recommend you find a way to do this exercise at home, as it should be done every day to maximize muscle growth. As far as triceps bodyweight exercises go, dips are the best for building muscle mass. The reason for this is that you’re in a suspended position when doing them. So, your triceps are working hard to keep your body stable, while also moving it up and down. And, you can also alter the angle of your body to target your chest more. This means you’re essentially doing a suspended pushup, and can get serious chest growth. You can create your own dipping station at home by using two chairs or the corner of a kitchen counter. So, they’re great to add to any home workout. The final exercise will target your shoulders and make them burn like crazy. Simply do a handstand against a wall, and lower your head to the ground then push up using your shoulders. If you can’t do this, then pike push ups are a good alternative. Get into the downward dog yoga pose and lower your head to the floor then push back up. All of these exercises can be done without any weights at all. And, each can be modified depending on your experience and strength levels. Add them to your workout routine today! The first strategy you can employ to start leading a healthier life is to find the ideal holistic doctor. Rather than placing primacy on the administration of medication, holistic doctors seek to facilitate healing and restoration in the patient’s mind, body, and spirit. There are a wide range of health services that these doctors can offer to realize this objective. Some of them include medical hypnosis and acupuncture. 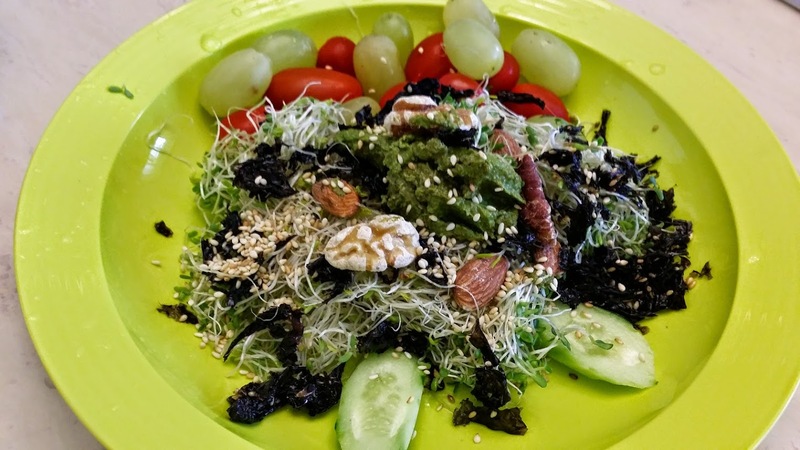 Holistic doctors will also oftentimes place emphasis on offering nutritional counseling services that help the patient eat the foods that promote optimal energy levels, mood regulation, and weight management. You can access information regarding these types of services by visiting the following website: www.drbryanmd.com. In addition to finding a holistic methods doctor, it’s a good idea to invest in personal training services. Doing so can facilitate health optimization by ensuring that you’re in the habit of exercising effectively and regularly. Personal trainers specialize in developing and consistently optimizing exercise routines that empower people to accomplish their fitness and health-related goals. Whether you’re attempting to lose weight, increase musculature, or develop a more toned physique, personal trainers can help you realize your objectives. Moreover, getting in the habit of exercising regularly will promote cardiovascular health and help you attain a new level of wellness. One final strategy you should employ to get healthy this year is to optimize your diet. Although many if not most people understand that a sound diet is the foundational pillar of great health, many of these individuals procrastinate about changing their eating habits. Don’t make this mistake. Instead, start taking steps towards diet optimization by replacing coffee with green juices and salty snacks with healthy trail mix. Individuals who are ready to take their health to another level should understand that there are several ways to make it happen. By finding a holistic doctor, hiring a personal trainer, and optimizing one’s diet, you will likely find that you start operating at a level of physiological efficacy and excellence you never thought possible! As July 2015 ends today, I ended the last day of the month by embarking on a new fitness regime this morning! With creaky and achy knees that give way whenever I run on the road, I have decided to give running and brisk walking a break to heal my aging knees. Inspired by the mil who swims for half an hour every morning (she’s 70 years old this year) and advised by the hubs, I have decided to swim every morning to give my knees a good break. I have never been a fan of swimming as I prefer to sweat it out on the road or gym but I have no choice but to go through a hiatus to heal my knees. Today, I found a renewed love for swimming! I swam for 45 minutes starting from 6:30am and felt really good after the workout in the water! The only thing missing is a swimming cap to hold my waist-length hair in place. In a few minutes, I will be driving to Mid Valley Megamall with the mil to shop for a swimming cap and a pair of goggles. Swimming, here I come and conquer the pool from now on! Yesterday was awesome rawsome lunch day for me. I do that twice or thrice a week, for lunch. Today is yet another day of going raw for lunch, well almost, but I will be adding an egg to increase my hemoglobin levels. I am anemic, caused by heavy menses, which in turn is contributed by a tiny fibroid in my uterus. My awesome rawsome lunch yesterday was Pesto Salad. 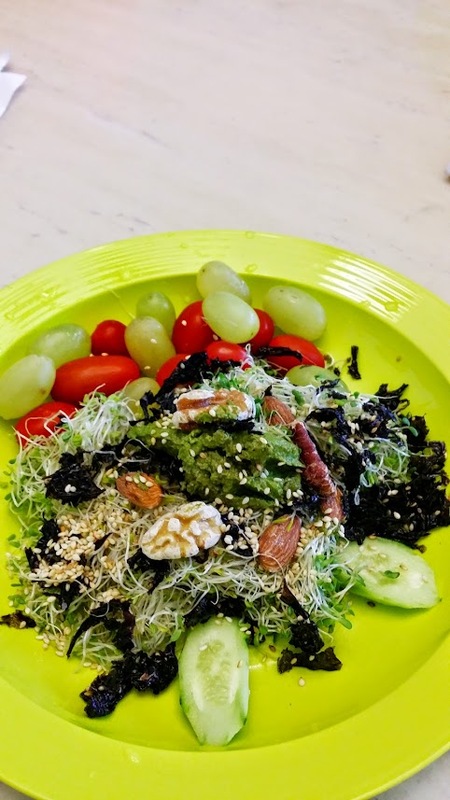 The salad composed of alfalfa and onion sprouts, walnut, almond, pecan, sesame seeds, organic Japanese kyuri, organic cherry tomatoes, green grapes, seasoned seaweed, fried shallots, Japanese Yuzu plum dressing and homemade Pesto paste. 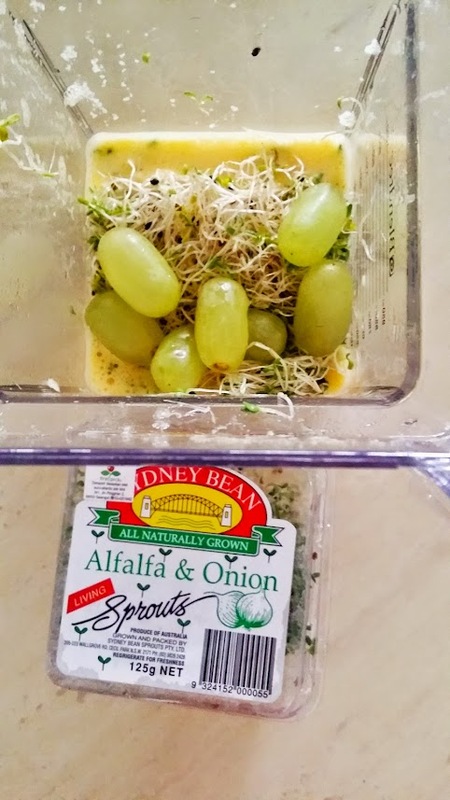 Before lunch, I downed 2 glasses of raw smoothie, consisting of orange, apple, green grapes and alfalfa and onion sprouts. 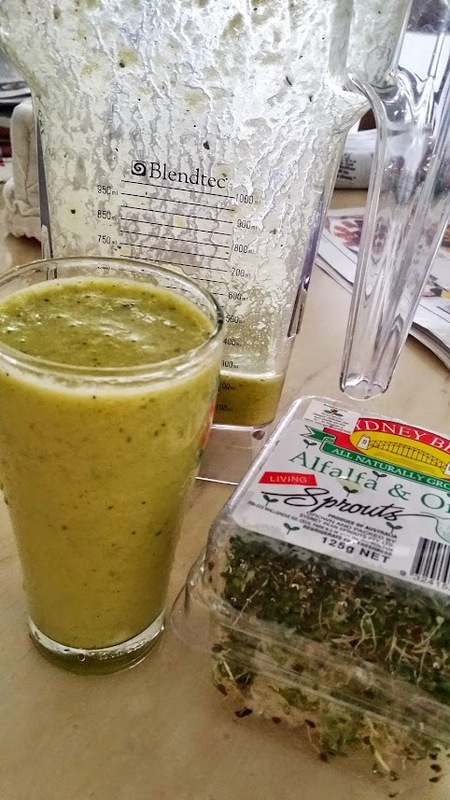 The kids and the hubs had orange and apple smoothie, sans the raw sprouts. Hear ye hear ye all you fitness buffs and those who intend to melt away your belly fat to have a fabulous bod! A friend of mine is organizing a BaNaNa Fitness Training (special bootcamp exercise) and has asked my help to spread the word around. My hubs has been attending this bootcamp at our neighborhood for almost a year and it is very intense. If I have the time, I will attend too. I am all for fitness but unfortunately, time is not on my side for now. Price: RM299/mth (Early Banana Rate at RM799 for 3 mths). For more information, you may send all enquiries to thespacekl@gmail.com or call 016-217 1060.
started smoking due to the influence around them. So make sure your children are able to make wise decisions when the time comes. According to statistics, obesity among children is on the rise. Obesity should be treated carefully as it can cause many health problems, and is one of the factors that lead to an increased risk of cancers in adults. Our dietary habits are formed since young, so the best way to maintain a balanced diet is to make it a habit for your family starting from your children. Avoid having too much fast food; instead, eat more veggies, fruits, and grains! Reduce the intake of salt, sugar, alcohol and red meat. Sometimes we might go overboard with these “feel-good” foods. 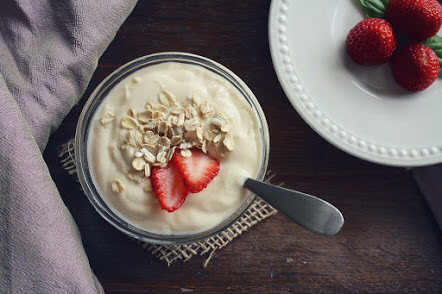 You can search for fun and healthy recipes online, healthy diet need not be boring and bland. Nowadays, there are many supplements to choose from, and they are available for all age group as well. Folic acid, Vitamin D, Iron and Multivitamin are recommended to lower the risk of getting cancer. Do consult your pharmacist for the ones that are most suitable for your family.